Calling all my introverted crowd-avoiding, bar-reluctant brides! Mikaela here, an introvert highly sensitive to her environment, who is forever declaring that there is hope for bachelorette parties! You don't have to have tattoos pleading strangers to return you if found plastered or kits filled with hangover cures or games pushing your bestie to drink herself to regret to have a good time. 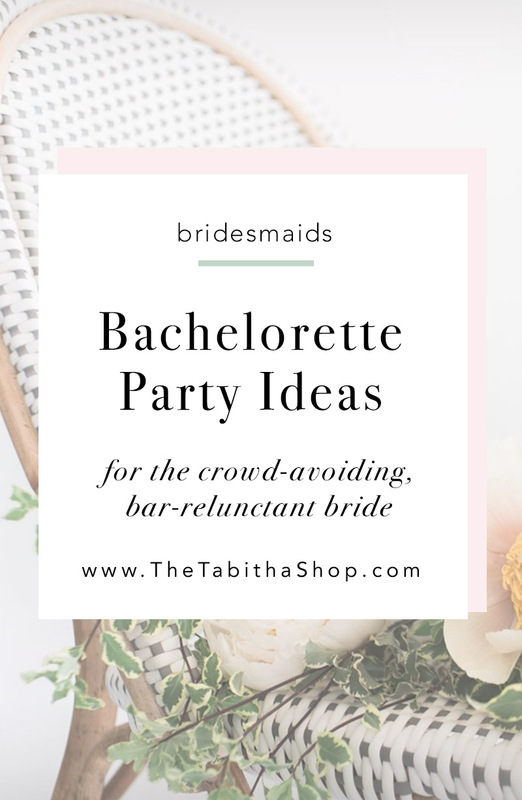 Bachelorette parties can actually be fun and you definitely don't need all the screaming and drinking and what-happened-last-night photos for that. Below are eight ideas that skip the bars. Book a whole pampering weekend! Schedule manis and pedis, hair cuts and blow outs, massages and facials. And if you really want to amp your bachelorette game, check into a weekend spa retreat for you and your besties to sit back and honestly relax. If you've always wanted to visit Nashville or Austin or NYC, now's the time! Book a cheap flight through Southwest or Spirit Airlines and bunk in the same hotel room together to save on money. Then, check out the sights! Just because you don't like bars doesn't mean you don't enjoy a glass of red. Find a local wine tour or brewery to sip on new wines while you nibble on cheese and catch up with friends. Bonus points if you have a gorgeous view overlooking a vineyard! Ok, I hesitated to put this on here, for fear of sounding like either an aging grandma or a pre-pubscent little girl. But, I think many of us have a secret crafter inside! Book an AirBNB in the middle of no where with a gorgeous view, pack ribbons, paintbrushes, and a glue gun in your bag, and you've got the start of a gloriously creative bachelorette weekend. If Netflix and chill is your favorite thing to do, why not do it for your bachelorette party? Rewatch your favorite movies with delivery pizza, chocolate chip cookie dough ice cream, and Sour Patch Kids. Like you're 13 again. Consider yourself a bit of a foodie? Then capitalize on it with some restaurant hopping! Eat your way through five or six courses at a different restaurant. Start with an appetizer at your favorite Italian place, then move on to your entree at your favorite Mexican place, etc. Nature + best friends + about to be married. Really, nothing better. Pitch a tent in a mountain valley or a thick forest, bust out the hiking boots, and get in touch with your nature-loving side. If you'd prefer a mattress that sits a few inches above the ground and made-for-you meals, then opt for glamping instead! For all my non-traditional brides who love nothing more than espionage, strategy, and trigger-pulling, I present to you the funnest weekend ever: paintball. To up the intensity, opt to wear an old bridesmaid dress or all white. The pictures alone, not to mention the memories, will be well worth it.